Agfa began to produce movie cameras in 1928, and the first machines were the Movex 12. Soon after it was renamed Movex 16. 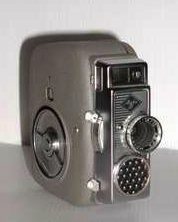 Agfa, in the same year (1928) produced the Movex 16-12 B. It is equipped with a lens Agfa Kine Anastigmat f:3,5 20mm. It is very heavy (kg. 1,900) and its measures are the following 69x125x165mm. It has the housing in metal, covered with black leather. This movie camera has only one running speed (16) and a fixed focus lens. This camera was provided with a sensational feature for the period (1928! ): with a singlewind of the spring-wound motor, the camera was able to to run 20 feet of film. This movie camera was produced in 1939. It is equipped with a lens Agfa Kine Anastigmat f:2,8 12mm. The machine weights kg. 0,950 and its measures are the following: 41x120x103mm. It has the housing in metal, covered with black leather. This movie camera has only one running speed (16) and a fixed focus lens. The "Movex 8 L" is the first movie camera equipped with semi-automatic exposure control. "L" stands for the coupled "Lucimeter" electric exposure control. Commercialized before the war, it became available again after the war. After 1949 it was advertised as "Die Sehende" (id est: "the seeing one"). 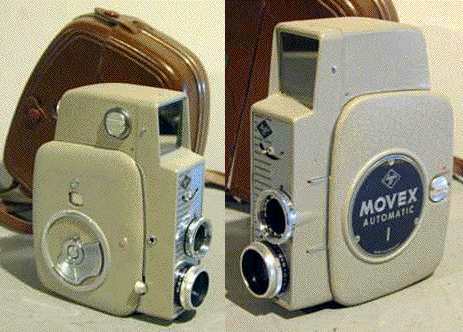 The Agfa Movex Automatic I was produced in 1958, and it was equipped with a lens Agfa Movestar 1:1,9 - 12,5 mm. This movie camera weighs 0,950 kg and its measures are 55x156x127mm. The housing is in light gray color metal. The Agfa Movex Automatic I looks like a Agfa Movex 88, with a huge viewfinder attached to the top and a different light metering cell attached to the front. This movie camera was produced in 1958. It is equipped with a lens Agfa Movexar f:1,9 13mm. The machine weights kg. 0,850 and its measures are the following: 55x120x118mm. It has the housing in grey color metal. This movie camera has seven running speeds. The "L" stands for the coupled "Lucimeter" electric exposure control. For this camera a wide-angle Curtar and a telephoto Longar attachements were available.